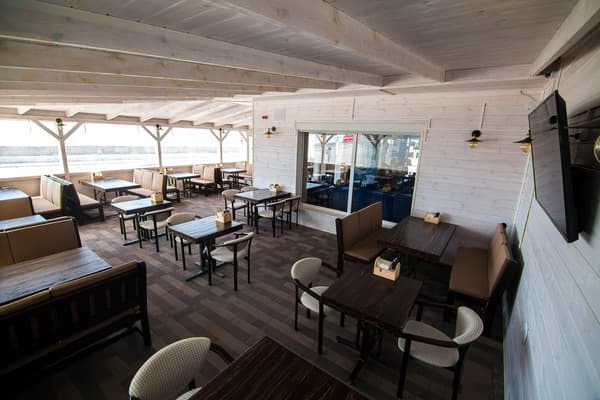 Hotel Maxim (building 2) is located on the very shore of the Azov Sea, in the center of Berdyansk, the area of ​​the third beach (from the sea at 10-15 m). The beach is 10 meters from the hotel. The hotel offers accommodation in cozy one-room and two-room rooms of various categories. 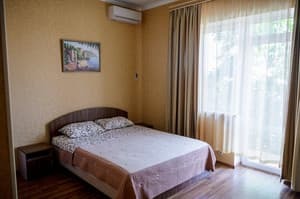 Each room has modern and comfortable furniture, high-quality bed linen, individual bathroom, TV, air conditioning, refrigerator. Meals are served in the cafe, which is located in the hotel building on the 1st floor and works round the clock. 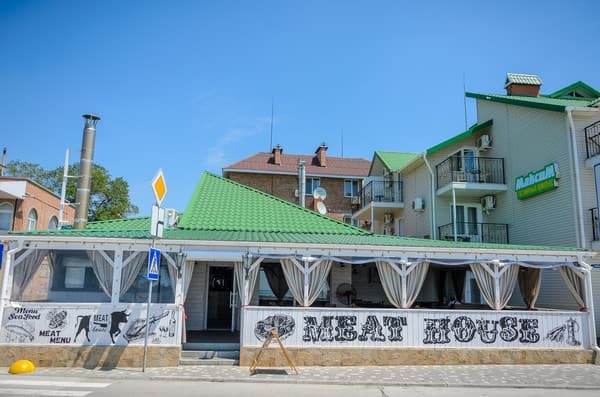 To the guests of the hotel "Maxim (Corus 2)" we offer dishes of Ukrainian and European cuisine. Also, vacationers can cook on their own in the kitchen, which is located on the summer site of the hotel between the buildings of the buildings. Not far from the hotel is Berdyansk water park "Cape of Good Hope" - the only water park on the coast of the Azov Sea. Distance to: bus stop "3rd beach" - 20 meters, railway station - 500 meters, bus station - 4.5 kilometers, market - 700 meters, supermarket - 300 meters. Free transfer from the auto and railway station is available. Berdyansk on request. Description of the room: Cozy 1-room, designed for 2-3 people. The room has all the amenities: refrigerator, plasma TV, satellite TV, air conditioning. Rooms are located on the 4th floor (attic). 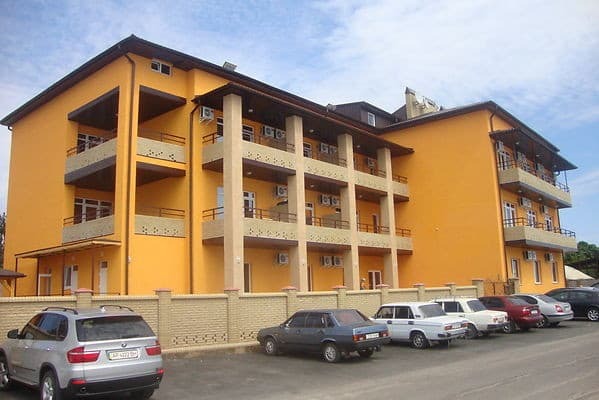 Description of the room: Comfortable 1-room apartment with balcony. The room has all the amenities: refrigerator, plasma TV, satellite TV, air conditioning. The room and balcony offer a breathtaking view of the sea. Rooms are located on the 2 nd and 3 rd floors. Accommodation 2-3 people. Description of the room: One room is designed for 2-3 people. The room has all the amenities: refrigerator, plasma TV, satellite TV, air conditioning. This room type is located on the 1st, 2nd and 3rd floors. View from the window to the private sector, which is behind the hotel. Rooms with balcony and without balcony. Понравилось месторасположение и номер. Хотя по правде сказать, на люкс он не тянет. Ужасно не понравилось, как в присутствии клиентов(то есть, нас) проверяли номер, когда мы выселялись. Складывалось впечатление, что нас подозревают в краже полотенец и простыней. Делать такие вещи нужно, пока гость выселяется на рецепшене. В уважающих себя отелях так и происходит. У нас остался очень не приятный осадок. Заплатит за люкс или полулюкс, уже не помню, и стоять перед мальчиком, который заглядывает во все шкафы, не унесли ли мы тапочки или рулон туалетной бумаги....Это очень не корректно! Children under 3 years stay free of charge in existing bedding. Children under the age of 2 years are provided with cots on request. The cost of placing on an additional place is to be specified at the time of booking. 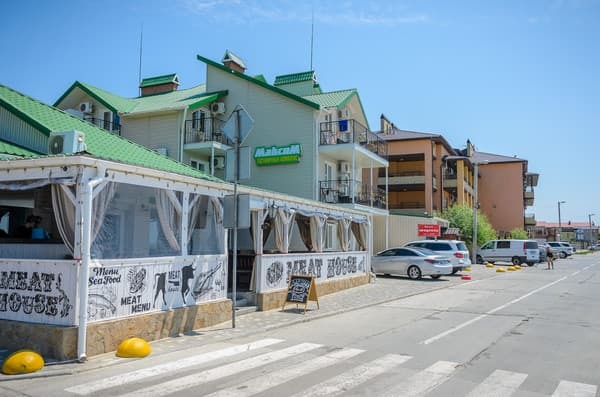 Hotel "Maxim" is located on the shore of the Azov Sea, in the center of the city of Berdyansk. The beach is 10 meters from the hotel. Not far from the hotel (1.5 km) is Berdyansk water park "Cape of Good Hope". Distance to: bus stop "3rd beach" - 20 meters, railway station - 500 meters, bus station - 4.5 kilometers, market - 700 meters, supermarket - 300 meters. Free transfer from the car and railway station in Berdyansk is available upon request.